Discussion in Expired Deals started by Eric John • Apr 18, 2012. Looking for a great Father's Day Idea, because we all know that Father's are sometimes very hard to buy for. 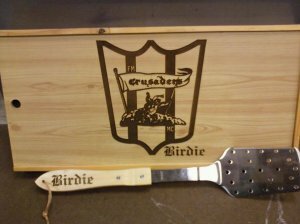 I stumbled across this Laser Engraved BBQ set, that is personalized and looks pretty Neat. The set contains 3 BBQ utensils with their name or the kids' names on the handles. Then the cover can be engraved with almost anything you can think of. Call 701-293-0077 for this great deal. $49.99 is the price.